System Health Checker is the PUP that uses misleading techniques to prevent removal. Use Reimage to locate malicious components and get rid of them faster than with uninstall instructions. A full system scan blocks virus reappearance and prevents traffic to malicious domains. 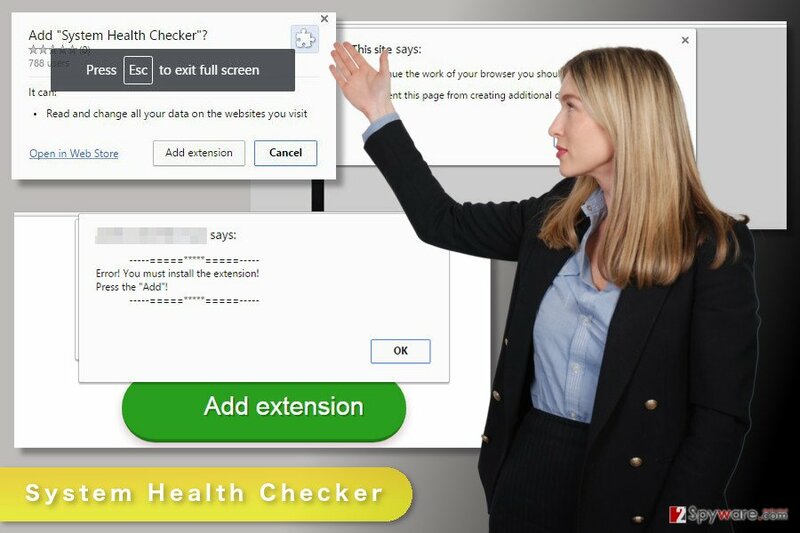 System Health Checker is a rough browser extension that is compatible only with Google Chrome web browser. It is presented as a useful tool that helps to ensure that computer’s system is working properly. However, it has nothing in common with protecting your device. It is a potentially unwanted program (PUP) that might cause undesired changes in the browser. For instance, it may change your homepage and default search engine to Yahoo Search. Switching back to Google or another search provider may be complicated. System Health Checker browser extension does not have a visible icon on the toolbar. Thus, you cannot simply deactivate it. What is more, this suspicious program prevents you from accessing Chrome’s extensions. If you try to do that, you will be redirected to chrome://apps/ page. Indeed, manual System Health Checker removal might be complicated. For this reason, we recommend going for automatic elimination option and getting rid of this PUP with the help of reputable anti-malware program, such as Reimage. It detects and deletes the hijacker, as well as other unwanted applications that might be hiding on the system. The so-called System Health Checker virus is distributed via suspicious websites that trigger push notifications and asks to install this add-on in order to leave the site. The reason why you end up on such website is adware infection. The adware might have sneaked into a computer with the help of freeware and started initiating redirects to misleading sites. However, if you found yourself on the Internet site that asks to install an unknown extension, you should close Chrome (or tab) immediately. Sometimes these websites disable close button, so you should force quit the browser. Clicking any other provided buttons, such as “Add Extension, “OK” or “Cancel” may lead to the installation of System Health Checker. The main purpose of this extension is unknown. However, it is suspected to be capable of tracking data or distributing potentially dangerous programs. Thus, if you suffer from redirects to suspicious sites that aggressively asks to install a browser extension, you should take care of your computer’s state. Do not wait until you accidentally install this suspicious app. However, if you already downloaded it, you need to remove System Health Checker ASAP in order to avoid possible cyber threats. 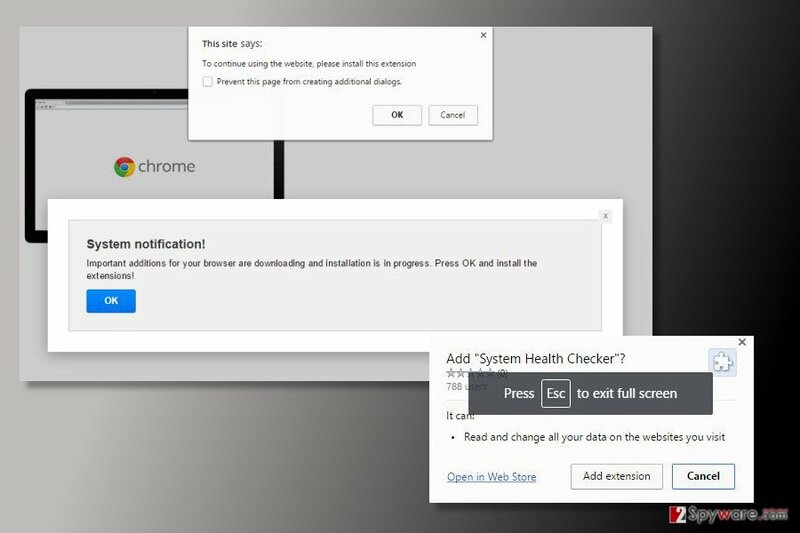 System Health Checker is a bogus Google Chrome extension that is aggressively promoted on suspicious websites. As we already mentioned, System Health Checker spreads via rough websites that deliver a pop up informing about a necessity to install a particular extension. The push notification claims that installation of the add-on is the only way to leave this website. Usually, the message includes “Add Extension” and “Cancel” button. Apparently, both of them are designed to install the extension. The “Cancel” button aims to trick users and force them to install System Health Checker extension. Clicking it leads changes the notification into a dialog box that suggests ticking “Prevent this page from creating additional dialogs” option. If you decide to do that, your browser will be launched in full-screen mode, and you will be forced to install it. However, in order to avoid System Health Checker hijack, you should force quit the browser instead of clicking any buttons. We also want to point out that redirects to these sites are triggered by an adware program that resides on the computer. It might have entered the system during incorrect installation of freeware or shareware. Thus, if you have recently installed a free program under Quick/Recommended settings, the System Health Checker adware might have been installed silently as well. Bear in mind that these settings do not openly disclose about additional third-party programs that are included in the software package. In order to avoid PUPs, you need to install new programs under Advanced/Custom settings. System Health Checker removal requires deleting browser extension and adware program that is responsible for redirects to suspicious sites. We highly recommend performing this task automatically. As we have mentioned, this add-on is quite hard to remove manually because it prevents users from accessing Chrome’s extensions list and has an invisible icon. Meanwhile, powerful anti-malware program can quickly locate and remove System Health Checker together with its components. However, if you insist of terminating this PUP manually, please follow our prepared instructions below. Follow the steps below to remove adware program and other suspicious entries from the computer. Once you remove all unknown programs, try to reset Google Chrome and remove all unknown extensions from it. Here, look for System Health Checker or any other recently installed suspicious programs. The instructions below will help you to get rid of suspicious applications that might be related to System Health Checker virus. Wait until you see Applications folder and look for System Health Checker or any other suspicious programs on it. Now right click on every of such entries and select Move to Trash. When in the new window, check Delete personal settings and select Reset again to complete System Health Checker removal. Once these steps are finished, System Health Checker should be removed from your Microsoft Edge browser. Here, select System Health Checker and other questionable plugins. Click Remove to delete these entries. Now you will see Reset Firefox to its default state message with Reset Firefox button. Click this button for several times and complete System Health Checker removal. Your task is to remove System Health Checker from the list of extensions and reset Google Chrome. If you cannot access the settings or list of extensions, please do not ignore this problem. Install anti-malware program and scan the system. It helps to eliminate all suspicious extensions from the browser. Here, select System Health Checker and other malicious plugins and select trash icon to delete these entries. Click Reset to confirm this action and complete System Health Checker removal. Here, select Extensions and look for System Health Checker or other suspicious entries. Click on the Uninstall button to get rid each of them. Now you will see a detailed dialog window filled with reset options. All of those options are usually checked, but you can specify which of them you want to reset. Click the Reset button to complete System Health Checker removal process. 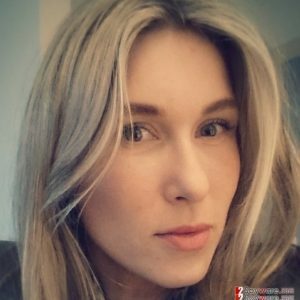 ^ What are extensions?. Google Chrome. Mobile DevTools by Google Chrome. ^ How to Identify and Prevent PUPS and Portable Apps. Phoenix TS. Certification Training Online & In-Person. This entry was posted on 2017-05-24 at 05:08 and is filed under Adware, Viruses. You can quickly scan the QR code with your mobile device and have System Health Checker virus manual removal instructions right in your pocket. How did you remove System Health Checker virus?